Gordon Stewart will be taking the rehearsals on the Wednesdays of 18th., 25th. of March and 15th April in preparation for the Hymnsing on Saturday 18th. April. We should attend at least 2 of the 3 rehearsals to take part in the Hymnsing. There will be no rehearsals on Wednesday 1st. and 8th. April. 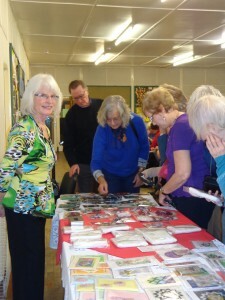 Choir member Ann Normanton has been making articles to sell to friends, choir and church members at her annual Christmas Craft Fairs since 2003. In 2014 her efforts raised £350 for Overgate Hospice. The rehearsal scheduled for tonight, Wednesday 21st January 2015, has been cancelled due to the snow.